Range of roof mounted mixed flow fans supplied as standard for extract operation. The models 500 and 800 are manufactured from high strength injection moulded plastic, and models 1300 and 2000 from high grade pressed sheet steel.The bases are manufactured from sheet steel.The cowls are manufactured from pressed sheet steel (500 and 800 models) or spun aluminium (1200 and 2000). 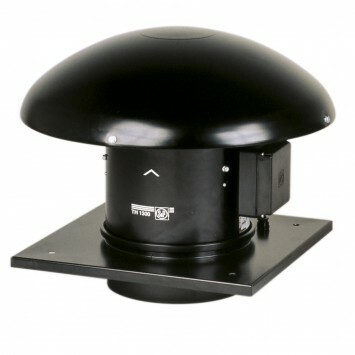 All models incorporate a bird guard and base cable gland entry point as standard. All metallic parts are protected with a black epoxy-polyester weatherproof paint coating. The motor and impeller casing can be easily removed by 2 fixing clamps. All motors are IP44, Class B, equipped with thermal protection and ball bearings greased for life. All motor have two speed connections also suitable for voltage speed control using electronic or auto-transformer controllers.